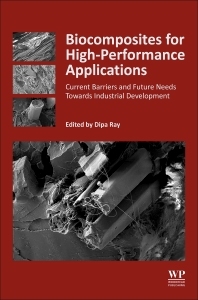 Biocomposites for High-Performance Applications: Current Barriers and Future Needs Towards Industrial Development focuses on future research directions that will make biocomposites a successful player in the field of high-strength structural applications. Topics covered include: recent research activities from academia in the biocomposite research field, valuable thoughts and insights from biocomposite manufacturing industries, the strength and weaknesses of biocomposite products, and the practical issues that need to be addressed to reach the next level. Dipa Ray is currently a Lecturer at University of Edinburgh, UK. Her main research interests are polymer composites with a special focus on biofibres, biopolymers and biocomposites. She has been the author of more than 60 papers in peer-reviewed international journals, over 30 conference proceedings and has written 9 chapters in books. She has been recipient of the ‘Fast Track Award for Young Scientist’ in India in 2006 and ‘Career Award for Young Teachers (CAYT)’ in India in 2008.